Home Hindu Snake Drinks milk? I wish to draw the attention of all those who still believe that live cobras (snakes) should be worshipped on this day. As a part of live worship, cobras are offered milk, which was never, is not and will never be a food for cobras or for that matter any snake in this world. But religious fanatics, who are blindfolded to the realities of the natural world, indulge in such senseless acts (which some people prefer to name as tradition) and therefore patronise the snake-charmers without realising the consequences of their acts and what the snakes have to go through to satisfy our insane beliefs and the so-called ‘religious sentiments’. Accompanying this post is an old photograph of a cobra that was confiscated from a snake-charmer in Mumbai by animal welfare volunteers. One can clearly see the mouth of this cobra is stitched with thread to prevent it from eating anything. 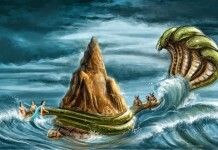 This is done at least 2-3 weeks prior to the Nagpanchami Day, so that the snake remains thirsty and hungry till this day. The hungry and thirsty snake then ‘drinks’ anything that is offered to it – whether it is milk or a soft drink! Some simple biological facts – Snakes are reptiles and milk does not form a part of their diet by any stretch of imagination. The drinking of milk is a phenomenon seen in mammals only. 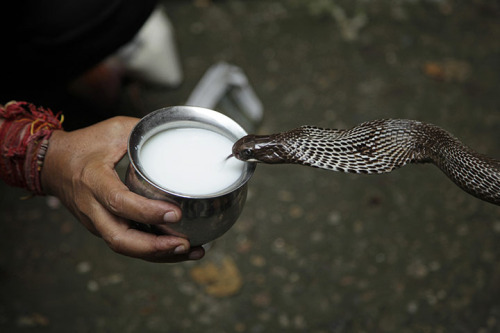 Unfortunately, snakes subjected to torture by snake-charmers drink milk in desperation; but that is unnatural. Neither its likes milk nor any supernatural powers drives it to drink it. 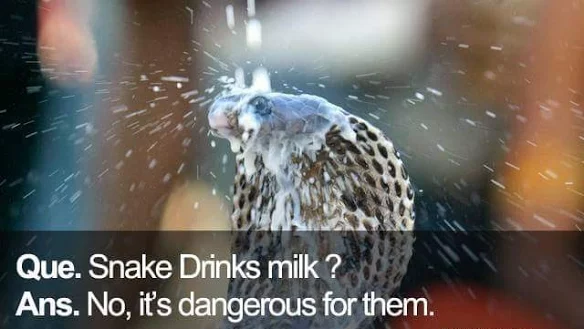 Milk is like poison for snakes. Ingestion of milk results in indigestion in snakes. At times, ‘devotees’ are seen pouring bowls of milk over the snake’s head which then blocks its nostrils, enters its lungs and eyes. The snake then dies a slow death. Thus OUR worship kills a creature that most Indian’s consider as GOD! Well, it doesn’t end here. The dead snakes’ skins reach the black market for sale and in making bags, belts, etc. An apparently ‘pious’ act may result in ruining a creature that has ecologically such an important role to play. Snakes are one of the most effective biological pest controllers by eating rats and mice that form a majority of their natural diet. 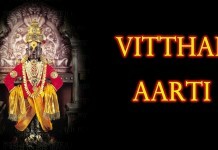 This month of Shrava, Devotees visit Shiva temples every Monday of this month. Generally, snake-charmers are seen soliciting people to feed their ‘Nag Devta’ within the temple precincts. Any such persons seen, please report to the nearest police station. The police are authorised to take action under the Wildlife (Protection) Act, 1972 against such snake-charmers. India’s culture has always revered life and has taught us to worship different forms of nature to ensure its protection and conservation and NEVER for its destruction. It is our own shallow understanding of our rich culture that is responsible for such outrageous acts that we blindly follow or twist for our selfish needs, without understanding the essence of such traditions.